Castle in the Air: Bookmaking Begins! What better way to spend a day then making artist books in our cozy, colorful classroom? 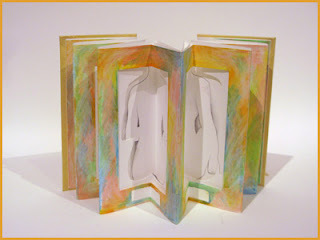 Today's class kicks off the Book as Object of Art six-class series, taught by bookmaker extraordinaire Alice Armstrong. Alice begin's the series teaching her students how to make Japanese Flutter books. For those of you who hold an interest in developing your artwork within the space and form of a book, there are still spots available in both sessions A and B of the class!